Man-eating monsters, plucky orphans, fart jokes: Some things never go out of fashion, at least for readers of a certain age. 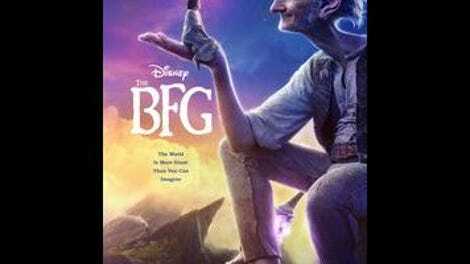 That’s why Hollywood has been laboring for two decades to make a movie out of Roald Dahl’s enduringly popular kid-lit classic The BFG, previously adapted (via animation) for British television. But now that the feature-film version has finally arrived, with blockbuster maestro Steven Spielberg pulling the strings and Disney fronting the bill, it’s easier to understand why it took so long: To watch the new live-action BFG is to wonder whether this beloved tale—rich with ostensibly cinematic elements, from skyscraping villains to a sprawling fantasy world—even really belongs on the big screen. Moving it there has somehow shrunk its humongous pleasures. Protective fans can rest easy: If anything, this BFG is too faithful. The movie opens just as the book did, with bespectacled preteen Sophie (Ruby Barnhill, suitably spunky) plucked from her orphanage by the towering, hooded figure she spots creeping around the streets of London in the wee hours of the night. Whisked off to the rolling hills of Giant Country, Sophie officially meets her kidnapper: The Big Friendly Giant, played—through the latest advances in motion-capture technology—by the spy of Spielberg’s Bridges Of Spies, Mark Rylance. Fearsome in size but not temperament, the BFG is a sensitive loner, using his enormous ears to eavesdrop on his fellow lonely-hearts and an enormous trumpet to send pleasant dreams into the minds of slumbering children. Unfortunately, he’s also the kindest of his kind, and the smallest; the nine other giants—boasting ghoulish names like The Meatdripper and The Fleshlumpeater (that one voiced by Jemaine Clement)—treat the world’s kids as delicacies, not companions. So much of The BFG, read or watched, is pure world-building. Dahl had fun with his title character’s malapropisms (the only thing The BFG mangles is the English language); he also spent more than a few pages getting into the nitty-gritty of his fantasy land, from a special drink that causes instant, violent flatulence (or “whizpopping”) to the conception of dreams as sentient, light-based organisms to be caught, bottled, and sometimes even combined, for the purposes of what we now might call Inception. Spielberg preserves almost all of this, losing only the more gruesome details of the other giants’ eating habits, but that fidelity is a part of the problem: While it’s theoretically heartening to see a family film that isn’t a noisy roller coaster of nonstop activity, it’s also clear that there isn’t much movie to be made from The BFG’s thin storybook narrative. For Spielberg, the project is at least partially a technical exercise—an opportunity to play with scale, to place an actor against dramatically enlarged versions of normal household items, and to dive and plunge his camera around the tree-trunk limbs and digits of oversized characters. The film’s best set pieces are reminders that no one integrates digital effects into a physical world quite as deftly as Spielberg: The atmospheric opening passage culminates with The BFG playfully, improbably disguising himself in the shadows of foggy London—dreamily captured, in characteristic shades of hazy blue, by cinematographer Janusz Kaminski—while a later sequence amusingly juxtaposes the decorum of Buckingham Palace with the impolite, inconvenient immensity of its guest of honor. But most of The BFG unfortunately reverses that real-to-fake ratio, so that we’re watching a single flesh-and-blood performer galavant against a chiefly digital environment. It’s one step removed from the flat, weightless spectacle of his Tintin movie. Spielberg and Dahl aren’t a perfect fit, honestly. The latter had a droll, sometimes macabre sense of humor, appealing to the darker fascinations of kids; he made his young readers feel like they were getting away with something. Spielberg, conversely, can be a hopeless sap, and while he’s done elemental wonders with leviathans—Jurassic Park’s hungriest attraction, those exterminating War Of The Worlds tripods—collaborating with Disney probably killed any chance that the giants here were going to be remotely scary, even for family fare. Working one last time with the late screenwriter Melissa Mathison, who wrote his most cherished all-ages entertainment (E.T. The Extra-Terrestrial, released the same year The BFG was published), Spielberg allows his sentimentality to dull the sharp comic edges of the book. As Dahl adaptations go, Fantastic Mr. Fox proved a much more successful blend of sensibilities, to say nothing of the nasty charge Nicolas Roeg left intact with The Witches. But maybe those were just more adaptable stories. The BFG is one of those cross-medium translations that slavishly adheres to its source material without quite reproducing its charm. 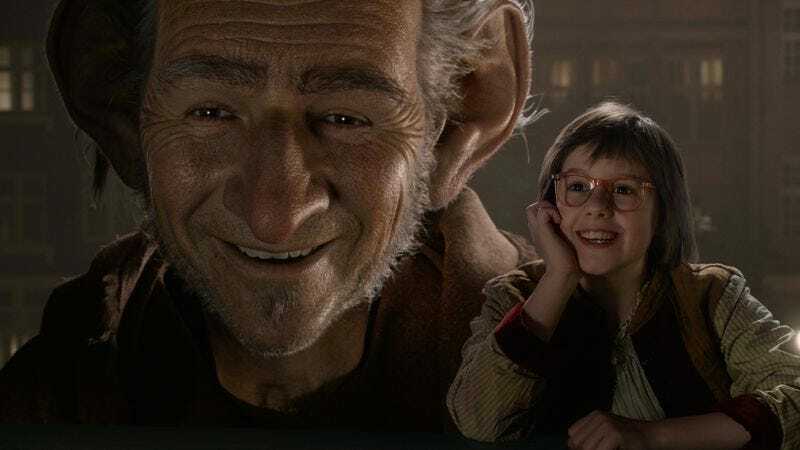 Spielberg must see a little of himself in The BFG, a big softie whose main pastime—concocting custom dreams, the results neatly visualized as shadow plays for sleeping kids—marks him as a proxy filmmaker. Mathison paints the central relationship as a surrogate family, uniting Sophie and her BFG through mutual loneliness, and the ending—one place where the film tweaks Dahl’s blueprint—aims for some of the teary farewell poignancy of E.T.’s upshot. But though Rylance invests his CGI avatar with a lot of winsome, offbeat personality, we’re still watching a child actor and a special effect struggle to recreate a friendship effortlessly conveyed in print. There’s no doubt that Spielberg has made The BFG his own, drowning everything in the tinkle of a familiar John Williams score and even managing to incorporate a kid in a red coat. But maybe this is one story that didn’t need to become his own, or really anyone else’s. State-of-the-art special effects are no substitute for Dahl’s inviting prose, for the dreams he blew into adolescent imaginations.